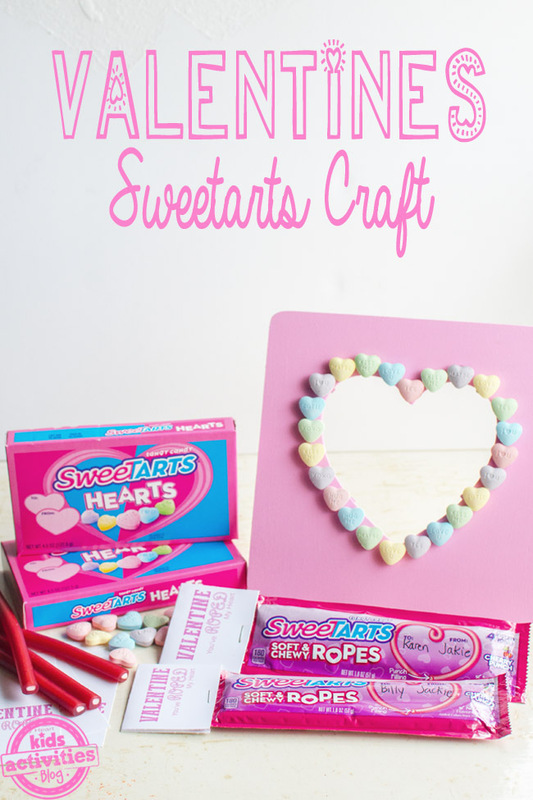 Celebrate all things love by making a super sweet Valentine’s Day photo frame craft with Nestle SweeTARTS Hearts and SweeTARTS Soft & Chewy Ropes. Nothing says, “I love you” more than a thoughtful handmade gift, and we’re excited to partner with Nestle to bring you these adorable crafts. They are perfect for the special people in your kid’s life, whether it be grandparents, teachers, parents, friends, siblings, or even the mail carrier. SweeTARTS Hearts and SweeTARTS Soft & Chewy Ropes are more than just a tasty treat — these Valentines treats are the perfect way to spread the love! With gift tags printed directly on the package, they make gifting to friends, classmates, and co-workers seamless. Both SweeTARTS Hearts and SweeTARTS Soft & Chewy Ropes contain no artificial colors and flavors so you can feel good about them too. First, cover your work surface with newspaper or something similar to protect it. Next, paint the wooden craft frame with two coats of pink acrylic craft paint. Allow to dry completely. 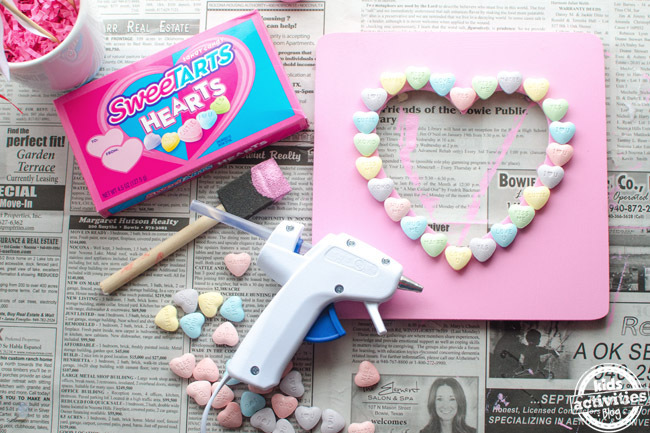 Now, using the hot glue gun, put a small dab of hot glue onto a SweeTARTS Heart and immediately stick it to the painted craft frame. Continue this process until the frame is decorated the way you want it. 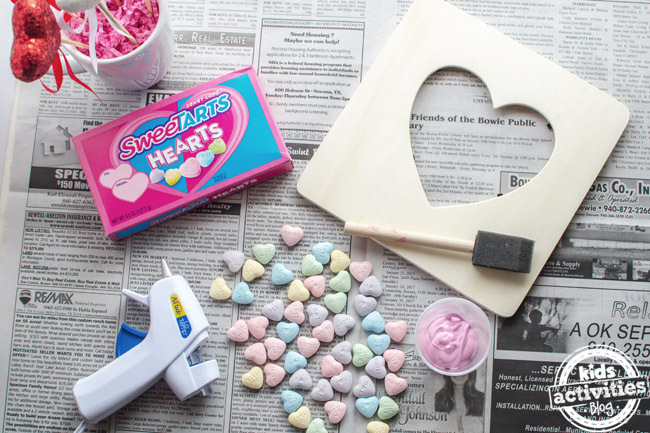 With inscriptions on each heart, play Cupid with the SweeTARTS Hearts to let your loved ones know you care with a sweet addition to any Valentine’s Day card or DIY craft. 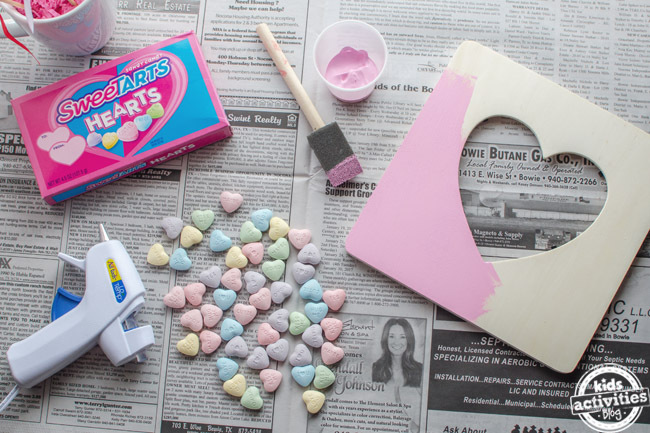 Isn’t this SweeTARTS Hearts Valentines Day Frame Craft so cute?! I love the idea of gifting it in a Valentines themed gift bag with matching tissue paper along with a box of SweeTARTS Hearts. 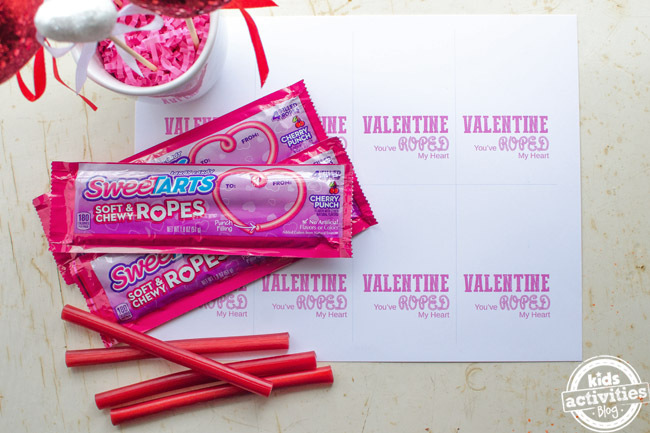 We’ve come up a super sweet FREE printable to go with SweeTARTS Soft & Chewy Ropes that you’ll have fun giving away this Valentine’s Day. SweeTARTS Soft & Chewy Ropes treat candy lovers to a soft, chewy, cherry-flavored licorice rope packed with a tart punch-flavored center. All we did to dress up these valentines was first print off this exclusive FREE You Roped My Heart printable from Kids Activities Blog. You’ll need to use scissors or something similar to cut the valentines into individual tags. Next fold in half and then staple to the end of each SweeTARTS Soft & Chewy Ropes. That’s it! 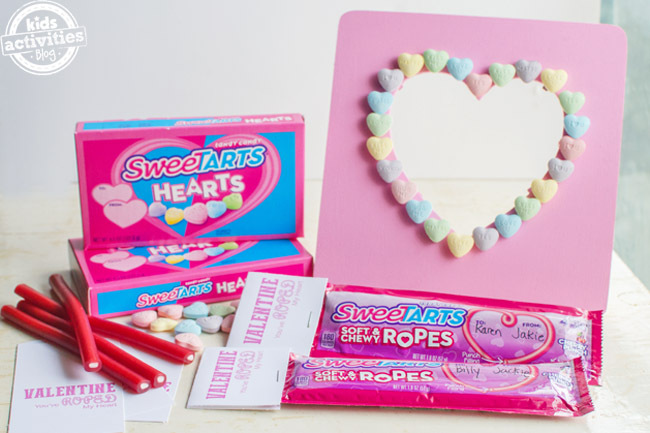 The SweeTARTS Soft & Chewy Ropes already come with a place where you can write who it’s for and who it came from making them even more fun to give away for Valentine’s Day! We hope these crafts we came up with inspire you this Valentines Day. 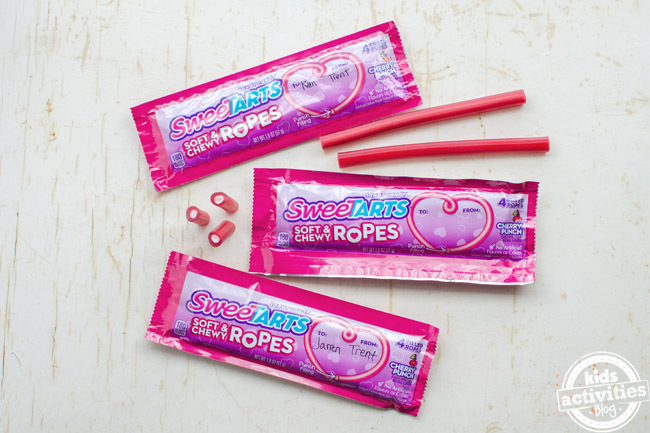 SweeTARTS Hearts and Soft & Chewy Ropes can be found retailers nationwide. 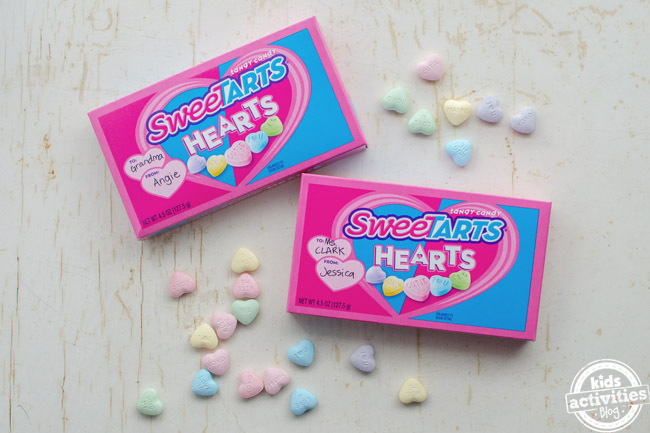 SweeTARTS Hearts (4.5 oz./MSRP: $1.50) and SweeTARTS Soft & Chewy Ropes (1.8 oz./MSRP: $.89) are the perfect pairing to complement your love-themed recipes, gifts and décor options this Valentine’s Day.